Rory and Cotton have pups!! 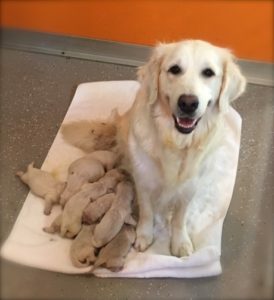 Our very own Rory (daughter of Indy and Angie) has delivered 9 beautiful and healthy English Golden Retriever puppies with Cotton. There are 5 females and 4 males. There are plenty of pups available at this point so don’t delay! They will be ready to go home around New Year. Rory and her 9 beauties!